Lafayette County, Missouri; c.1935. From Fiegenbaum-Gerber family; all rights reserved. Somewhere in Lafayette County, Missouri, worked stopped for a moment, and a photograph was taken. 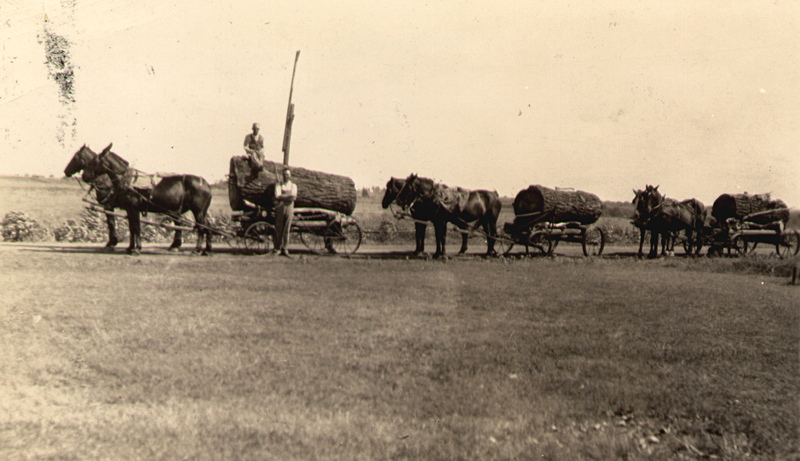 Edwin Friederich Fiegenbaum, in a typical pose with his arms folded across his chest, and August Henry Begemann, atop the lead wagon, stop for a break while hauling sections of a cottonwood tree to the sawmill. The lumber was used to construct a shed and a granary on the farm on Douthit Road that was owned by Martin Herman Fiegenbaum at the time. Later, it was the home of the John Henry & Katherine M. (Maun) Fiegenbaum family and then the Henry Martin and Mary Ellen (Schmutz) Fiegenbaum family. The photo was taken about 1935 on the Douthit Road farm. According to my informant, J. W. Fiegenbaum, the photographer, who was very likely John Henry Fiegenbaum, would have been standing in the side yard of the old house that used to stand on that farm and was facing south. Judging by the shadows, the time must have been about mid-day. Perhaps the men had stopped for lunch. No one has explained how the huge sections of log were loaded on to the wagons. Notice the mighty small ax driven into the top of the second log. It is the only cutting tool in sight. Perhaps someone, who had spent a lot of time cutting and chopping, had a sense of humor to display it so prominently.